In Pylon Network we have developed a neutral database based on blockchain technology where energy data, like consumption and production, from energy market stakeholders, are stored and shared. 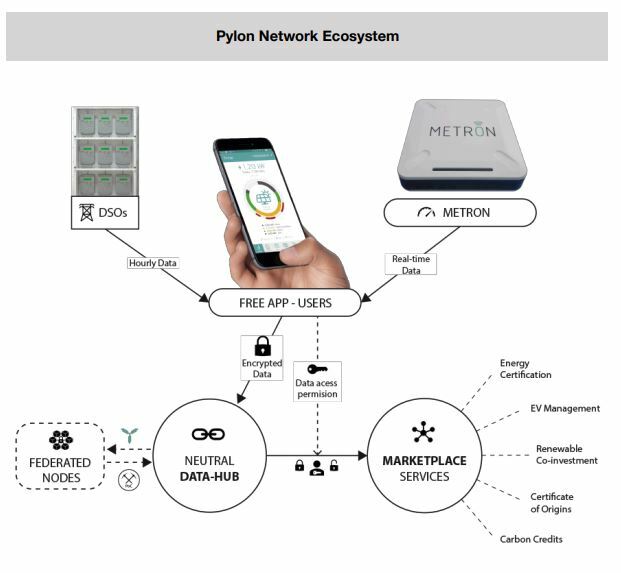 Pylon Network database allows the user (data owner) to be in control and decide who they share their energy data with, hence actively participating in the market. With Pylon Network we achieve a level of data neutrality, which can play the role of the enabler for a new level of innovation and competition capacity in the energy markets. 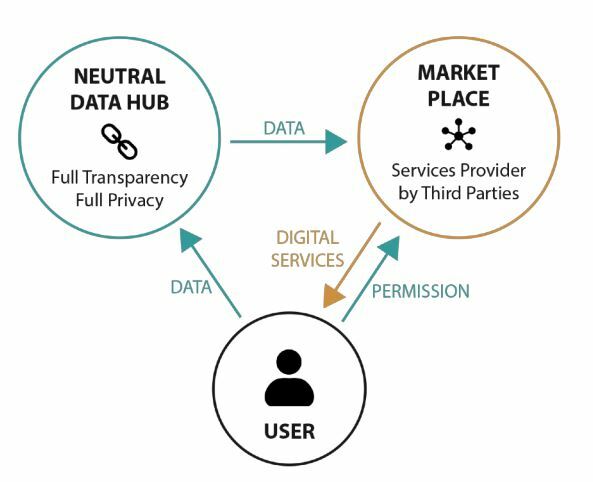 Now is the consumer/ producer/prosumer himself/herself who, with an easy tool, decides what to do with their private information, being able to choose which third-party – retailer or Energy Service Company (ESCO) – can access it and offer back digital services to them – helping in that way consumers (Figure) save on their bill. What are the value propositions of Pylon Network in regards to the energy sector? The data sharing architecture in Pylon Network, not only empowers the end user (consumers/prosumers) by helping them save money & energy, but also empowers the retailers companies and ESCOs, who can offer more targeted, informed and personalized services (e.g. electricity contract) based on high quality, granular consumer data. The blockchain code of Pylon Network is the first that is designed specifically for the needs of the energy sector – not only from a technical point of view (see here). We offer Pylon Network’s blockchain technology with an Open Source (OS) license to play the role of an inclusive communication protocol accessible to all stakeholders of the energy market. We developed our technology with the main objective of accelerating the energy transition and not leave anyone behind in the fast-evolving era of decentralization, digitalization, customer engagement and transparent cooperation in the energy sector. How does the METRON smart meter works in relation to Pylon Network? All the information about the role of METRON in Pylon Network can be found here. What is the role of Pyloncoin (PYLNC) and Pylon Token (PYLNT) in Pylon Network? In Pylon Network there are two asset, the Pylon Token or “PYLNT” and the Pyloncoin or “PYLNC”. Both assets play a particular role within Pylon Network and are related. The Pylon Token – PYLNT is a digital asset that represents the participation in the Pylon Network platform and with it come the rights associated with the distributed benefits (rewards) in the form of PYLNC. The Pyloncoin – PYLNC is a digital currency, which is created to reward the work done by the nodes, that validate and maintain the neutral database supported by Pylon Network’s blockchain. At the same time, a part of the coins created goes to green energy producers and prosumers (see “Light Nodes”), serving as an incentive/support mechanism for those who invest in renewable energy generation technologies. PYLNC has several utilities within the platform and the demand for coins will grow as more users and renewable generation plants become integrated. Our Token Paper (released on Feb. 4) contains all information regarding PYLNT and PYLNC – and can be found here. Where can I find more technical characteristics of Pyloncoin (PYLNC)? Pyloncoin Core is a SHA3 Keccak C algorithm (certified by NIST (National Institute of Standards and Technology) and the winner of several cryptographic contests), based on a fork of LiteCoin and a consecutive fork of CREAtivecoin. An overview of the characteristics and design considerations of Pylon Network’s blockchain can be found here. Where can I get updates and follow the progress of the project? Is there a way to access Pylon Network DEMO and see what is already demonstrated? Up to date we have integrated appr. 8,000 users – all customers of our pilot partner and cooperative retailer from the Basque country of Spain, GoiEner. A history of the development of our project can be found in our Blog and our social media/communication channels (found at the bottom of our homepage). We have identified the lack of cooperation in the energy sector as a barrier to the transformation of our energy systems into intelligent, smart ones. We have identified this problem to all markets that we have analyzed. We see it as an epidemic of the energy markets and we develop Pylon Network for being the cure. We see open-source software as the ultimate cooperation tool for the digitalization of the energy sector and in full accord with blockchain’s “inherent” values and incentive mechanisms that was originally created for. Open source software (OSS) is crowdsourced and as a result, it offers numerous benefits – cost, flexibility, freedom, security, and accountability – that are unsurpassed by proprietary software solutions. OSS also has long-term viability and is always on the cutting-edge of technology. All aforementioned characteristics are things that our energy systems, our environment and our societies desperately need for dealing with the global problem of climate change and the degradation of our natural resources in the most timely manner. OSS as a cooperative tool can play a crucial role towards that direction. What does it mean that Pylon Network’s Blockchain is Open-Source? It simply means that Pylon’s core blockchain code (Pylon Coin), designed for the needs of the energy sector, has a non-commercial license. Which, in turn means that the code is free to copy, edit or modify and be integrated to any smart meter or any other energy tool/platform!